The VFW for a dart league. Yep, dart league. At the VFW. Where you have to knock and sign in at the door. Up and down Kavanaugh Blvd Friday morning (b/w the early hours of 5:30 and 6:00) for a 3 mile run with my friend and running partner Julie. An extremely fun Friday date on an extremely gorgeous day with our friends Shannon and Nash at the LR Zoo. It started out as a comedy of errors. The Zoo wasn't open when we arrived (and we got there well after the specified opening hour). The geese were scary and breeding (SIGNS: CAUTION: ATTACK GOOSE! DO NOT PET! 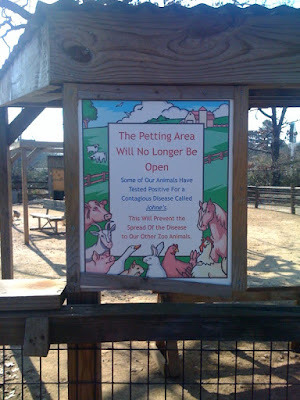 ), the petting zoo was closed because of an infectious disease, the bears were still hibernating, the pavilions were under construction, the fish food was empty. But despite (because of?) all these things, we had the best time. Lots of birds and big cats out, diabetic monkeys, gorgeous weather, and a train ride made us more than happy. A made-up 10K (6 miles) on Saturday morning with my friend Jenny! (We wore the aforementioned t-shirts. It's not a race until you have t-shirts!) The race was a tribute to our friend Melissa's move to LA. (This is her final weekend in town!) We based our t-shirt design after a night of debauchery in which Melissa made, oh, three thousand inappropriate 'your mom' jokes (specifically about my mama, Linda, and Jenny's mama, Libby. 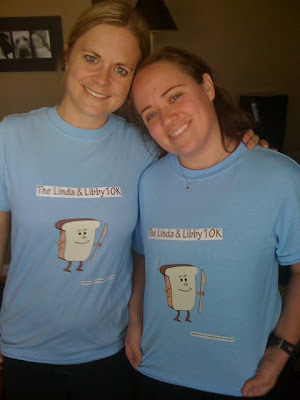 Hence the "Linda and Libby 10K" title. Also, we think Linda & Libby would be damn proud of our running achievements. Here is a shot of us after we made it home from "the race." One of my bloggy friends suggested I host a virtual 10K (maybe 5k?) and make us all t-shirts. I send you the t-shirt, you send me your race picture for the blog. Oh, we're doing it! We are SO doing it. Dinner and drinks for Melissa's going away party. I have no words to type about Melissa going away in fear that I may burst into tears as I type. It was such a wonderful, laughter filled weekend. We were able to focus on friends and family and fun. I'm so appreciative that I have the opportunity to do that. It was a great weekend. So glad I got to be there! I'm in on the virtual racing thing. That sounds awesome. I love the virtual race-I'm in! And I feel like every time I've ever gone to a zoo I've had a similar experience. shut it. or i'll cry. and the 7 kids? that's cuh-razy. I wouldn't come out alive.